With the wings supported with temporary brackets, use a sting line along the leading edges wing-tip to wing-tip to make sure the wings a perfectly straight (bottom right). 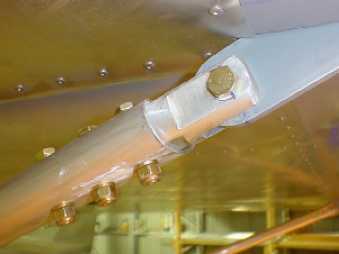 You can adjust the order of the spacers on the wing to get the alignment correct with the attachment bracket jutting out from the cabin. Use a spirit level on top of the cabin and wing to get both surfaces level. TIP: Brace and clamp 1" X 1" angle from one side of the cabin to the other protruding 200mm on either side not only to support the wing, but this will help in aligning the wing top and bottom. 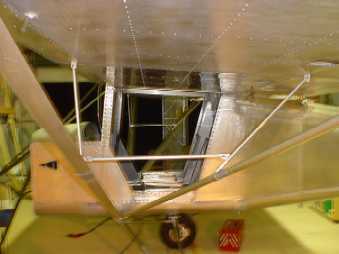 At the other end, adjust support brackets to near the correct height with the wing tips raised according to the drawing. The marker lines of the top of the wing and the cabin are used to make sure the gap between the wing and the cabin at the front and the back are correct. Use clamps to hold the wings in position before drilling any holes then use a 1/8" drill and clecos to hold the wings front and back in position before drilling 5/16" holes for the leading edge and 1/4" for the trailing edge. 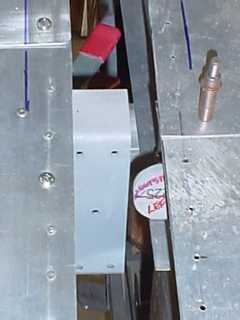 A metal cover will be cut and held into position later to cover the gap. TIP: Use cardboard under the wing to protect it's surface from rubbing on the 1" X 1" angle support bracket and slide the aileron control arm through the guide block into the cabin and make sure it slides freely before drilling and bolting the wings to the cabin. 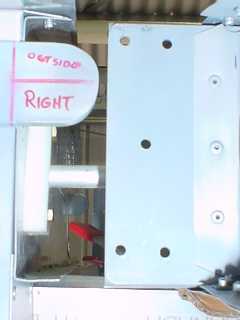 TIP: Before cutting the struts and drilling holes, clamp a spirit level on the cabin frame and continually check to see that the aircraft remains level otherwise you could end up with the wings out of alignment and not the required 32mm above the horizontal when the supports at the end of the wing have been removed. 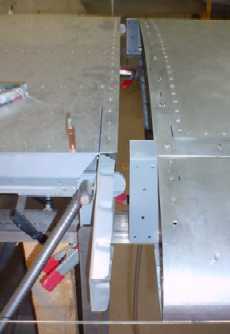 It is important to fit the wings to both sides before removing the supports as the aircraft will go out from the horizontal. 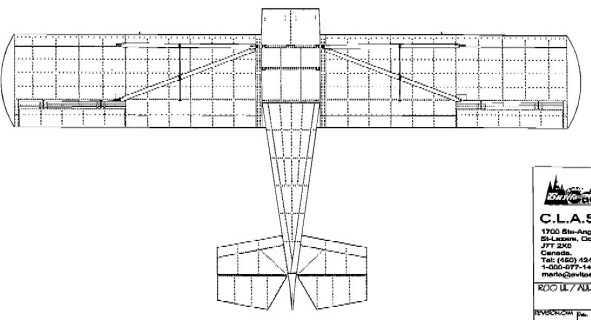 When fitting the struts to both wings, follow the instructions in the drawing and make sure they are raised a further 20mm above the 38mm because when the supports have been removed after fitting, the weight and flex in the wings will bring it back to the correct height above the horizontal. 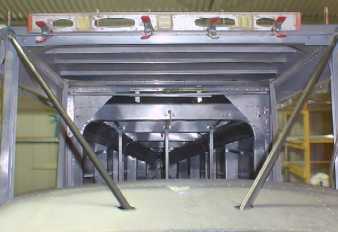 The spreaders have now been constructed and bolted into position between the struts and the under side of the wing. TIP: Use a sprit level to set out the placing of the clamps that go around the wing strut. This will ensure that when you mark and cut the rods, they will be the right length and end up vertical, or horizontal for the spreader that keeps the wing struts the correct distance apart. 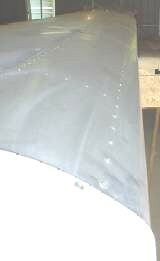 The top fairings have been cut, drilled and screwed into position with the trailing edge folded back on itself 20mm so the fairing on the underside of the wing can be attached. TIP: Make sure the wing is attached in its correct position before marking out and cutting the fairing. Attach the fairing from the trailing edge and work your way back to the leading edge before wrapping under the wing making sure the skin does not buckle or lift to cause a gap. The next stage is to cut and fit the fairings for under both wings which act as the inspection window when working on the fuel lines, and in particular, the fuel grade plastic tube used to show the quantity of each fuel in each tank. 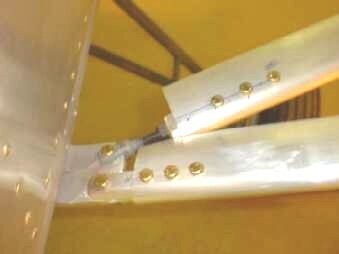 TIP: The inspection fairing should be able to be removed without interfering with the doors or other structural components, and be easily removed as the plastic fuel line should be replaced every 2 years. The fairings also provide access to the electrical power cable for the strobe and the plastic tube for the static ports attached to the cabin structure on the left wing, and also the antenna and headset cables attached to the cabin structure of the right wing. It is advisable to keep power cables and communications cables separate to avoid interference.